“The Hebrews conceived of an overseer god, an angry just and sometimes cruel god; and many sects denied, then, the idea that other living beings beside man possessed inner sprits. The earlier beliefs (prior to the Hebrews) represented a far better representation of inner reality, in which man, observing nature, let nature speak and reveal its secrets. The Hebrew god, however, represented a projection of a different kind. Man was growing more and more aware of the ego, of a sense of power over nature, and many of the later miracles are presented in such a way that nature is forced to behave differently than in its usual mode. 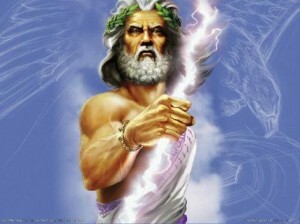 God becomes man’s ally against nature. The early Hebrew god became a symbol of man’s unleashed ego, God behaved exactly as an enraged child would, had he those powers, sending thunder and lightning and fire against his enemies, destroying them. Man’s emerging ego therefore brought forth emotional and psychological problems and challenges. The sense of separation from nature grew. Nature became a tool to use against others. Sometime before the emergence of the Hebrew god these tendencies were apparent. In many ancient, now-forgotten tribal religions, recourse was also made to the god’s to turn nature against the enemy. Before this time, however, man felt a part of nature, not separated from it. It was regarded as an extension of his being, as he felt an extension of its reality. One cannot use oneself as a weapon against oneself in those terms. In those times men spoke and confided to the spirits of birds, trees, and spiders, knowing that in the interior reality beneath, the nature of these communications was known and understood. In those times, death was not feared as it is in your terms, now, for the cycle of consciousness was understood. Man desired in one way to step outside of himself, out of the framework in which he had his psychological existence, to try new challenges, to step out of a mode of consciousness into another. He wanted to study the process of his consciousness. In one way this meant a giant separation from the inner spontaneity that had given him both peace and security. On the other hand, it offered a new creativity, in his terms. Now: At this point the god inside became the god outside. Man tried to form a new realm, attain a different kind of focus and awareness. His consciousness turned a corner outside of itself. To do this he concentrated less and less upon inner reality, and therefore began the process of inner reality only as it was projected outward into the physical world. Before, the environment was effortlessly created and perceived by man and all other living things, knowing the nature of their inner unity. In order to begin this new venture, it was necessary to pretend that this inner unity did not exist. Otherwise the new kind of consciousness would always run back to its home for security and comfort. So it seemed that all bridges must be cut, while of course it was only a game because the inner reality always remained. The new kind of consciousness simply had to look away from it to maintain initially an independent focus. I am speaking here in more or less historic terms for you. You must realize this that the process has nothing to do with time as you know it, however. This particular adventure in consciousness has occurred before, and in your terms will again. Perception of the exterior universe then changed, however, and it seemed to be alien and apart from the individual who perceived it. God, therefore, became and idea projected outward, independent of the individual, divorced from nature. He became the reflection of man’s emerging ego, with all its brilliance, savagery, power, and intent for mastery. The adventure was a highly creative one despite the obvious disadvantages, and represented an “evolution” of consciousness that enriched man’s subjective experience, and indeed added to the dimension of reality itself. To be effectively organized, however, inner and outer experience had to appear as separate, disconnected events. Historically the characteristics of God changed as man’s ego changed. These characteristics of the ego, however, were supported by strong inner changes. The original propulsion of inner characteristics outward into the formation of the ego could be compared with the birth of innumerable stars- an event of immeasurable consequences that originated on a subjective level and within inner reality. The ego, having its birth from within, therefore, must always boast of its independence while maintaining the nagging certainty of its inner origin. The ego feared for its position, frightened that it would dissolve back into the inner self from which it came. Yet in its emergence it provided the inner self with a new kind of feedback, a different view not only of itself; but through this, the inner self was able to glimpse possibilities of development of which it had not previously been aware. In your terms, by the time of Christ, the ego was sure enough of its position so that the projected picture of God could begin to change.